Does sriracha make your taste buds do the cha cha? Then you’ll love this tasty Asian-style recipe—it’s like a party in your mouth. 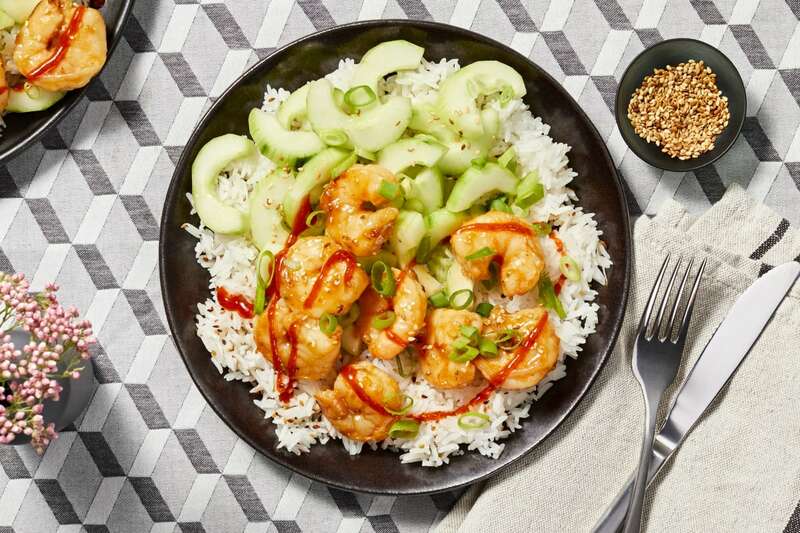 It features plump, tender shrimp in soy sauce with some of the spicy chili sauce mixed in for lively heat. 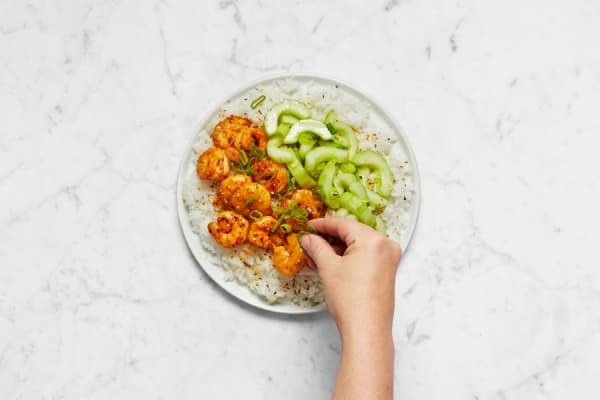 But that’s not the only thing getting in on the fun: a cool crisp sesame cucumber salad and fluffy white rice complete this bonanza of bold and brilliant flavors. Melt 1 TBSP butter in a small pot over medium-high heat. Add half the sesame seeds and toast, stirring constantly, until fragrant and light golden, 30 seconds to 1 minute. 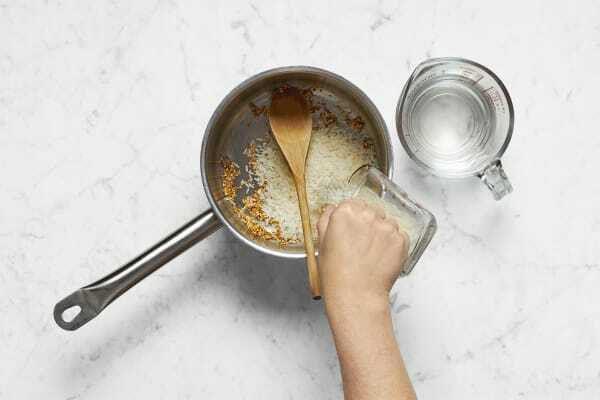 Stir in rice, 1¼ cups water, and a pinch of salt. Bring to a boil, then cover, lower heat, and reduce to a gentle simmer. Cook until tender, about 15 minutes. Keep covered off heat until meal is ready. Pat shrimp dry with paper towels. Season with salt and pepper. 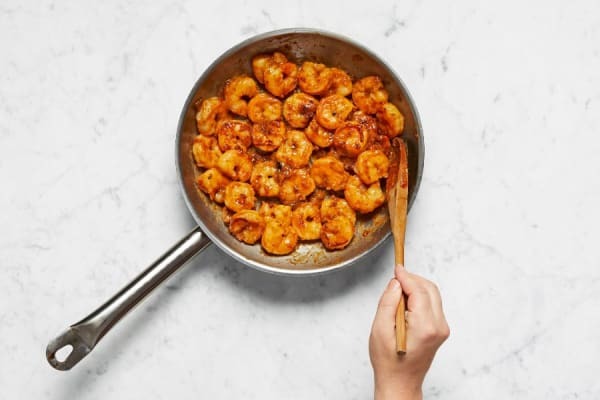 In a medium bowl, whisk together 2 tsp sugar, soy sauce, 2 tsp sesame oil (save the rest for step 4), 2 tsp water, cornstarch, and half the sriracha. Add shrimp and toss to coat. Wash and dry all produce. 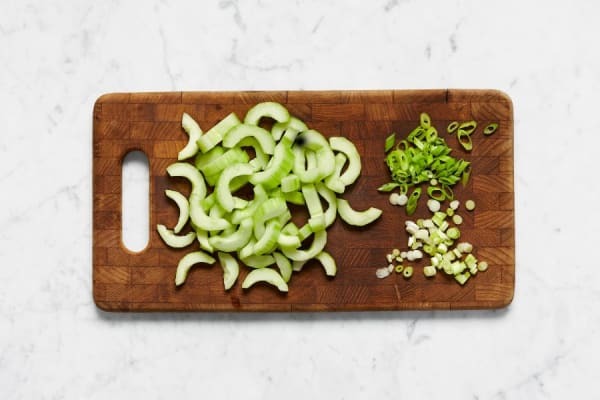 Peel cucumber, then halve lengthwise. Scoop out seeds with a spoon and discard. Slice flesh crosswise into thin halfmoons. Trim, then thinly slice scallions, separating greens and whites. 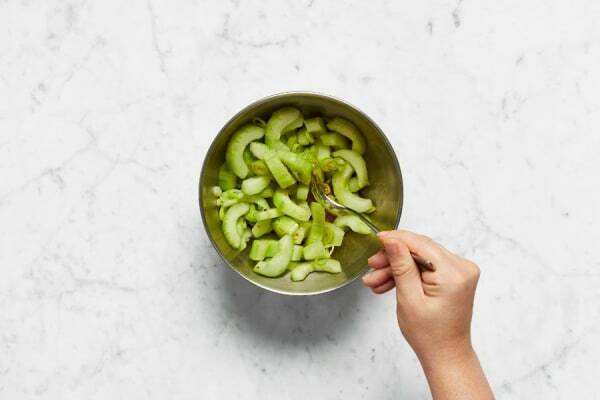 Place cucumber, scallion whites, vinegar, remaining sesame oil, 1 tsp sugar, and a big pinch of salt and pepper in another medium bowl and toss to coat. Heat a medium pan over mediumhigh heat. Add shrimp and its marinade, as well as 1 TBSP liquid from bowl with cucumber salad. 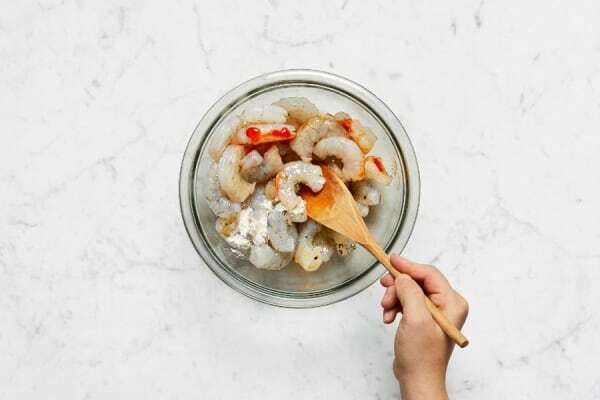 Cook, until marinade begins to thicken and shrimp is firm and opaque, 3-4 minutes. Season with salt and pepper. Remove from heat. Fluff rice with a fork. Season with salt and pepper. Divide rice, shrimp, and salad between plates. Drizzle with any sauce in pan. Sprinkle with remaining sesame seeds and garnish with scallion greens. Drizzle with remaining sriracha if desired.